Get a jump-start on the garden season by starting your own tomato seeds indoors. Here’s how. Most of us will probably want to buy seedlings rather than growing tomatoes from seed, since seeds take more time, effort and space. 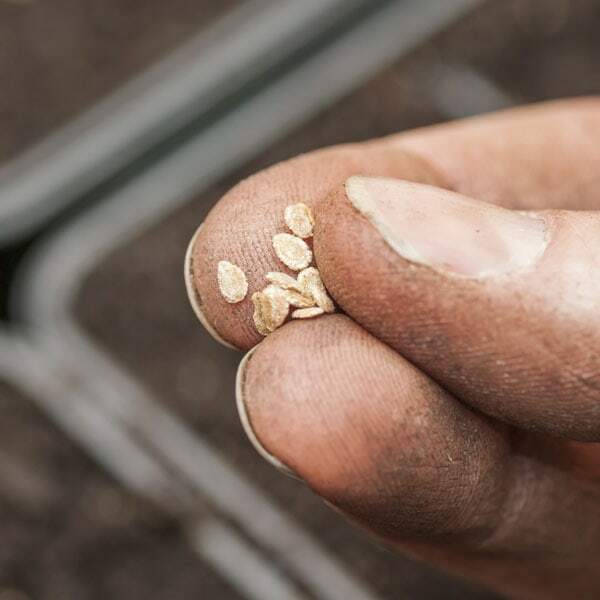 That said, only the most popular heirlooms are available as seeds, so if you’re hankering to grow an unusual heirloom variety, you’ll probably need to start your own plants. 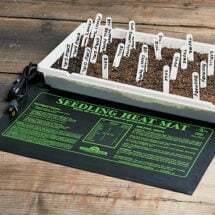 Most seed-packets advise you to start seeds indoors about six to eight weeks before the last anticipated frost in your area, which is fine if you live in an area that gets frost, but not much help if you don’t. Even in coastal Southern California, where frost is practically unheard of, there is a growing season, and plants set out too early will suffer. A good guideline is to put plants out when days are reaching the high seventies and nights don’t drop below fifty-five. Give your garden expert care from the very start. It’s easy when you have the right ​seed starting ​supplies​ from Planet Natural. 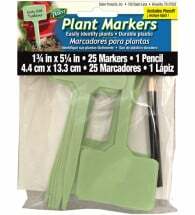 We carry ​all the equipment you need ​to keep your ​young plants thriving​. If you start too soon, your seedlings will probably outgrow either your pots or the light you can provide them indoors, sometimes both. The result can be weak, “leggy” plants — all stem, since they’re struggling to reach upwards to better light, and few, yellowish leaves since they lack the light for photosynthesis. Once outdoors, they’ll have to devote energy to recovering their health, rather than to sheer growth. This will put you behind the season, not ahead. Not good. If you start too late, you may miss the season entirely. Also not good. Soil: Starting from seed need not be pricey, but it’s worth investing in a good potting mix, rather than using garden soil, which can contain weeds and insect pests. It also tends to be less compacted, which means that young, vulnerable roots need work less hard to make their way through it. 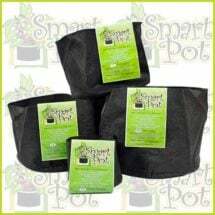 A potting soil that contains peat moss will help retain water during the germination stage. Do you want to grow AMAZING tomatoes? 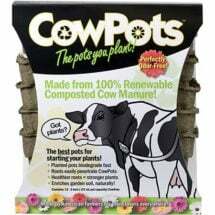 Start your young plants off in Roots Organics Potting Soil. 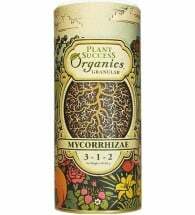 It’s a ready to use organic mix with a unique recipe that enables better drainage and encourages a vigorous root structure. You won’t believe the difference a good soil can make! Containers: Any of a dozen containers works. Flats are classic, but are not required. Egg cartons work just fine, though they’re quickly outgrown. Some gardeners use cardboard milk or juice containers (washed, of course). Cut them down and punch a few drainage-holes in the bottom of each. Another great option for starting seeds indoors is the plastic containers that strawberries and other fruits come in. They don’t need cutting to size, they have lids to keep seeds moist, they’re often deep enough to make transplanting to another container unnecessary, and they’re perforated to protect against over-watering. Most containers do have drainage holes, so unless you’ve got them stored in a spare bath-tub, you’ll need to set them in some sort of outer layer to protect the top of Grandma’s grand piano. Flats often (but not always!) 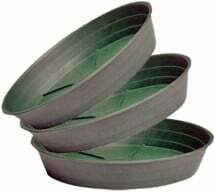 come with a matching “shell,” and these plastic containers, like cookie sheets with overgrown sides, are available at most gardening stores and garden centers. Cookie sheets themselves work fine, but watch out: you’d be surprised how many will rust and be ruined, cookie-wise. Seeds: For reliable results, start with store-bought seeds. Many tomatoes on the market are hybrids which will not necessarily produce the sort of fruit they came from. There are, of course, exceptions: I have a friend who composted a bunch of rotting tomatoes one winter and who got lovely volunteers that produced precisely the sort of tomatoes he’d had to throw out. 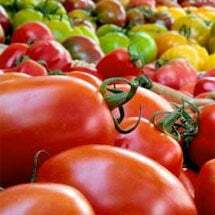 Planet Natural offers heirloom tomato seeds that are non-treated, non-GMO and NOT purchased from Monsanto-owned Seminis. 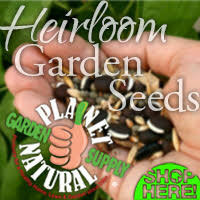 Best of all, seed packs are shipped FREE! Check the seed packets for maturation dates, to be sure that the variety you’ve chosen will indeed produce tomatoes before snow flies in your neighborhood. There’s nothing worse than nursing a tomato plant to lush maturity, then watching it wilt with frost before its flowers set fruit. There are ways, though, to urge a plant along as the season nears its end, and to protect plants from the first mild frosts without investing in a full-fledged greenhouse. Read about Extending the Growing Season and How to Ripen Green Tomatoes, on this site. 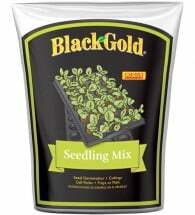 Sow seeds a quarter to half an inch deep, and water gently but thoroughly. It’s important that seeds remain moist until they sprout. A seed that has become wet and begun germinating will die if it dries out. It helps, therefore, to cover seeds with a layer of plastic, or just stick the flat in a plastic bag, to retain moisture. In a warm climate, mold may develop on the surface of the growing medium, but this takes a while and need not be a problem. A paper bag, which allows some water to evaporate, will also work, but only until the seeds sprout, since it also cuts off light. Cheese-cloth or part of an old tee-shirt or sheet also works, and allows enough light through to retain after sprouting. 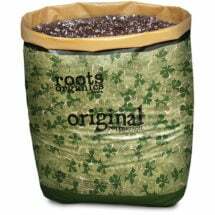 If you are using a closed plastic bag, the seeds may not need watering at all before they germinate. If the flats (or whatever container you’re using) are open to the air, check them every day. But remember, the seeds should be damp, not swimming. Depending on what cultivars you’re growing, seeds should germinate in 10 to 14 days. Once you see green above the brown (i.e., the seeds sprout) you don’t want anything lying on the young plants, so if you’ve used plastic or cloth to retain moisture, either remove it or elevate it. Some light-gauge wire, bent into hoops, provides the best support for bags or cloth, but a few sticks will do. Once they germinate, make sure that the seedlings receive a lot of intense light and keep them warm and constantly moist. Water whenever the soil begins to feel dry. “Warm” here means daytime temps between 65 and 85˚F, and nighttime temperatures of 60 to 65˚F. 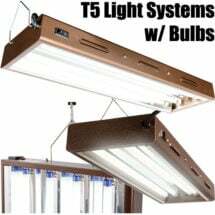 Our best T5 Grow Light (bulbs included) is great for seedlings, cuttings, houseplants, flowers and more! Produces more than double the output as normal fluorescent fixtures. Ideal for shelves or over bench tops. 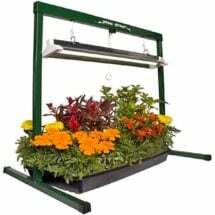 For optimal growth, seedlings need 12 to 16 hours of light a day, so if you’re low on south-facing window-sills, you’ll probably need to use some kind of supplemental lighting. Fluorescent lights work well but need to be within six inches of the seedlings or you’ll end up with tall, spindly plants. If you have your seedlings on a window sill, be sure to turn them daily to keep them from acquiring a permanent southward crick in the stem. When the seedlings have four leaves, transfer them to deeper pots, still using a light potting mixture. Work with care, so as not to disturb the roots or bruise the young plants. Put a layer of potting soil (about an inch) in the bottom of the new pots, then tip the seedling to transplant into your hand or scoop it out of its old home with a spoon. 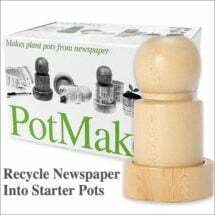 Set the seedling in the new pot (about 4″ by 4″ works well, and 4 to 6 inches deep) and carefully fill the pot with soil, covering most of the seedling stem. Only the leaves should be above the soil line. If this leaves lots of space at the top of the pot, more soil can be added as the plant grows. If you don’t get around to repotting tomato seedlings until the plants have developed several sets of leaves, pinch off all but the top clump, leaving no more than three sets of leaves. Repeat the whole process when seedlings are 8 to 10 inches tall, if it’s not yet time to transplant outdoors. Tip: Tomato stems will root if they are on or under the earth, so each time you transfer to a bigger pot, remove the lower-lying leaves and place the uppermost leaves just above the soil line. This ensures that the tomato will have a solid, deep root system which will provide the plant with adequate support and nutrients.